Yes, you too can go out and buy a classic Harry Seidler or Robin Boyd-designed home – with the rare listed exception – and demolish it. It happens all the time. Somewhere around the middle of the Twentieth Century the development of Australia as a nation seems to have ground to a halt. That is one conclusion to draw from a close examination of the National Heritage list – a list of 114 items that represent “critical moments in our development as a nation”. A total of five items have been added since 1950. The asymmetry in those figures reveals much of heritage attitudes to a multicultural Australia that barely existed before the 1950’s. Admittedly the National Heritage list is a rarified coterie of ‘critical places’, including natural and cultural icons such as Bondi Beach, Flemington Racecourse and Melbourne’s Royal Exhibition Building. But even moving down the food chain to State Heritage listing (typically a longer list of state valued places), the representation of post war Australia is equally diminutive. It represents approximately 2% of the total number of items placed on most State Heritage registers. How does it feel to know that 98% of Australia’s important ‘moments’ happened before most of you were born? Ok, so this might be taking a statistical liberty, but given that most of Australia’s modern icons were built after the war, in that archetypal nation-building period, this is still bad news. Because heritage listing represents the only substantial protection against summary demolition. As the perpetual churn of our city’s metabolism does its work, heritage listing may not guarantee protection but it sure makes the demolishers life more complicated. The whole heritage listing business however is lope-sided, revealed most clearly in how it treats residential architecture. For while it protects great swaths of non-descript pattern book two-storey terraced houses (who’s only qualification is that of having made it through a century), it systematically ignores a great many prized yet unlisted architectural achievements of the post-war years, as they are routinely transformed into landfill. Anyone with the money in their pocket can go out and buy a classic Harry Seidler or Robin Boyd designed home and (with the exception of a handful of listed ones) demolish it. It happens all the time. Why then, if modern architecture is so good, is it relentlessly demolished and disfigured? There are a number of factors. In the case of modern era houses the most common factors are a combination of premium locations and modesty of size. Much of our best modernist residential architecture was constructed at a time when prime sites with beach or harbour views were reasonably affordable. This was also a time when homes were typically half the size of today’s. Given the current ratio of land to building value, it’s little surprise that new owners can’t resist the impulse to capitalize. It’s a familiar pattern; new money buys into the old wealthy suburb professing a love for its rich patina, then proceeds to rebuild it. Another, rather prosaic factor, is maintenance costs. Modernist architects were innovators in aesthetics but also in construction, not always with great success. Innovations like Burley Griffin’s Knitlock prefabricated system was an early precursor, but it wasn’t until the Fifties and after that building technology really started to change; plastics, composite sheets, laminates, new adhesives, developments in concrete construction and glazing technology, all allowed much more flexibility in form making. But in their enthusiasm, sometimes architects neglected minor practical details, like rainfall. And so the great modern era of innovative architecture was also an era of leaks. This is problematic in a country where, according to architect and heritage expert Howard Tanner, “we’re not particularly good at looking after our buildings. Yet because of our weather almost all buildings require significant maintenance every 25 to 30 years. That means time, energy and money is needed to keep them in good condition, forcing the owner to decide if they want to keep the building or start over again. Sadly many don’t make it past a single generation”. And so the loss of much great modern architecture is partly a problem of basic mathematics; the maintenance bills start to run up every 30 years, while the protective provisions of State Heritage departments don’t kick in for at least 60 years, leaving buildings to fall prey to demolition faster than they can age sufficiently to be loved and valued. The result is a built environment equivalent of short-term memory loss. Tanner, who is a member of the six person Australian Heritage Council advisory board, lists a dozen central Sydney modern masterpieces that have fallen, amongst them: Anzac House by Bunning and Madden (1957), P & O Building by Fowell, Mansfield & Maclurcan (1963), Kindersley House by McConnel Smith and Johnson (1960), not to mention the State Office Block by Ken Woolley (1964) which made way for Renzo Piano’s Aurora Place. He believes we are not doing nearly enough to protect our modern inheritance, which he says, “in some cases should be considered an ‘endangered species’…. in urgent need of protection, just as we protect endangered animals and plants”. The NSW Office of Environment and Heritage agrees, finally. For some time it has focused on the standard repertoire of heritage activities; Convict, WWl & WWll and Governor Macquarie period. It has also recently redressed past neglect of Aboriginal heritage. 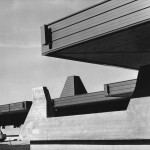 But as of 2012 the focus will finally turn to Modernism. Not a moment too soon, considering that its heritage list of over 1500 items includes approximately 30 items from the post war period. What is it with 2%? But state heritage offices have neither consent authority nor do they have legislative powers. That rests with the Department of Planning. So what happens when the two portfolios (which are often under the one minister) conflict? What happens if a great piece of Australian architecture finds itself out of place, or worse, conflicting with the latest state planning edict. In the case of Canberra’s Flynn Primary School the answer is, five years of continued community action and equally as dogged government obstruction. Designed by Australian Institute of Architects Gold Medal winner Enrico Taglietti the Flynn Primary School represented a radical new way to design for education; open plan and adaptable, for associative learning and flexibility of use. In commissioning the building in 1971 the National Capital Development Commission proudly proclaimed its progressive brief, “Education is now seen as a matter of developing latent powers, cultivating attitudes and providing an environment for stimulating activities”. Taglietti, who was in his hay day one of the few creative sparks in Canberra’s otherwise beige suburban landscape, did not have to be asked twice. He applied his formidable creative energies to produce what he considers to this day “one of the most important buildings that I ever designed”. It quickly became a focal point for the Flynn community and represented an exemplary meeting of modernist aesthetics and community affection. 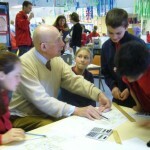 Then came the State Government’s announcement in 2006 that it planned the staged closure of no fewer than 39 schools across Canberra. Flynn was amongst the first to close, initially with the intention to turn it into part public housing, part private development. Given the building’s unique design (highly praised in a report from the AIA), it is surprising that a commissioned report by Purdon Associates in December 2007 failed entirely to mention of the building’s architecture. 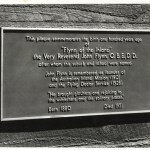 Perhaps they were conscious of their client’s concerns that heritage listing may complicate matters, for the 30 page report exhaustively covered the building’s planning policy, site characteristics, social considerations, history and future use potential, but failed to acknowledge that Flynn is an important building by one of Canberra’s most respected modernists. Not surprisingly the report recommended its demolition, rezoning for residential development, sub-division and sale, with expected revenue to state of over $5M. The community fought back and succeeded in burying the Purdon report. 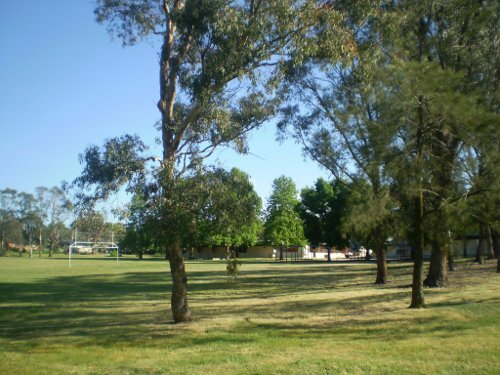 But plans for the school’s redevelopment, including partial demolition, have continued despite the community’s attempts to have it listed on the ACT Heritage Register. So far they have failed, despite specialist heritage analysis that has delivered unequivocal support for such a move. Under normal circumstances the school would be a Lay Down Misere for heritage listing. But tumultuous education cut-backs are rarely normal and the ACT Government has met the community’s passion with comprehensive ambivalence. (In writing this story the author contacted the Minister for Heritage, Simon Corbell but did not receive a reply.) The sorry saga may well reach its dénouement in February 2012 as the campaigners take their fight to the Supreme Court, at no small cost to the Flynn community. Staggeringly, in all the time that the school’s heritage listing has been under formal review, construction work on the site has continued. Having initially granted planning consent, the ACT Planning and Land Authority have failed to review its decision, allowing construction to continue, very likely in conflict with the ACT’s own Heritage Guidelines. Such stories of threatened modernist architecture don’t always end badly. Perth’s Council House was almost one of Australia’s lost modernist heroes, when in 1994 it was emptied for removal of asbestos, and the State Government summarily decided it should be demolished. Their logic, echoing Howard Tanner, was routine maintenance. It was built in 1963 and by 1994 it was in need of considerable refurbishments. The total figure quoted for the work was $42M. So State Government decided to demolish and start from scratch. A public debate followed, with some damning it as outdated and others heralding it as West Australia’s finest modernist building. When the decision was made to retain the office building and refurbish, it was partly a result of vocal opposition but also partly a pragmatic consequence of low interest rates at the time, which made it cheaper to service a loan than pay rent. The building was lovingly restored and reopened to the council in 1999. 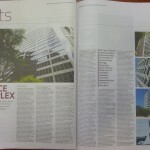 More recently interior architects Geyer were commissioned to rationalize the council’s use of the building, which has just been completed, fully restoring the building to its past glory. It finally achieved heritage listing in 2006, but only after a change of both government and Heritage Minister in 2001.